You don't have to take our word that our products are reliable and cost efficient. Read through our satisfied client testimonials, and you'll see why Affordable Cabins and Sheds is the first choice in storage sheds. We love our new shed. The crew that came out (Brian, Sam and Cody) were wonderful. We definitely recommend them to anyone looking for a great built out building"
Great quality shed professional built at an affordable price!! Thanks"
Let me say the crew, Brian, Sam, and Cody did a superb job yesterday." Attaching some pictures of the shed, looks great. Maybe when we get it painted I'll remember to send photos. Thanks so much!!!" John and his crew did an outstanding job. They brought the daylight with them each morning and I have never seen anyone more organized. We look forward to many years of enjoyment with our new bunkhouse." Thanks for a job well done "
Sorry I didn't get back to you sooner, but moving has time getting away from us. Just wanted to say THANK YOU for your help in getting the build complete – WOW – you have a great customer service !! The crew leader, Brian, was on-sight a little before 7:00AM as promised and was done @ 1:00PM – STUNNING – Brian and his crew worked together like a well-oiled machine!!! I'd say clock-like precision; it was like each of them knew what the others needed before anything was said!! AMAZING!! The shed looks great, they left everything neat and clean and I am one VERY SATISFIED CUSTOMER!!!! The neighbors were also impressed (I'll send them your way if any get really interested, eh?)! Thanks again for all your help, and please pass on a "Job Well Done" to Brian and his crew for me. God Bless,"
John and his crew did an outstanding job for us today. We now have an awesome 10×16 shed. We live in a subdivision with very narrow roads and steep hills. Your on-site construction was the perfect solution to the problems of moving a pre-constructed building to the site. If you are looking for a shed… call these guys!" My building looks very good. The guys that built it were very nice and Courteous, and did a great job. I think their names were Bryan, Sam and Hayden. They are very hard workers." Love it! We just had our first shed completed today. The crew arrived when they said they would, finished the work in a timely manner (in one day! ), and left the worksite clean. We are very pleased with the work quality and professionalism and looking forward to our next purchase." I just wanted to touch base with you about my new shed. Your men, Sam, Brian and crew were here when they said they'd be, started working immediately, and didn't stop until the job was done, just 6 hours later! I am thoroughly impressed with their craftsmanship and quality of work. The men greeted me and said goodbye with a handshake, something men just do not do much anymore. My neighbors are standing in their yards just admiring my new shed as I type. Please tell your men I said good job! I will be referring your business to all of my friends!" Thanks for getting our shed built before this weekend. We will move our daughter’s furniture into it this weekend. This will save us a lot of time and trouble." I have attached a photo of my newly painted shed for your viewing, and to also keep the warranty. A good buddy of mine painted it for me while I'm overseas. I am very happy with the shed, and the guys did a great job building it." Just wanted you to know that the inspector was here yesterday, Garage passed with flying colors. Thank you and your crew (John, Mike, and Cody) so much for all your hard work. We are very pleased. I am attaching a time lapse video I made of the construction process, if you'd like to see it." I just wanted to let you know my shed is beautiful and well built. Thanks to you and the guys (John, Mike, and Cody). They were really nice and cleaned up very well." "Marty Fox quoted a building via his website and we set a date for the project. John, and his crew, showed up at 8:15am on the day they promised to build. They went to work immediately and built a 12X16 storage building with a 10X16 Lean-Too carport (equipment shed) attached. The building is very well built, the framing and construction are square, and they left no trace of trash or construction materials. If I had to build another storage building tomorrow, I'd call Marty at affordashed.com and I'd know I'd get a quality building at a fair price." My shed turned out really nice. I'm very pleased with it and wanted to thank you. I'll send you pictures when I get it painted. Thanks again!" Bryan, Sam, and Hayden did a great job – on time, very professional, good quality and a pleasure to deal with. Thanks again!" Just want to let you guys know you did a great job on my new building. And to let the man (Sam), that shared Christ with me, know that was worth more than the price of the building. You don’t find many people who care were you spend eternity. SO thanks again for great job and good fellowship. " Your guys (Bryan, Sam, and Crew) did a great job today. They were Very courteous and professional. I'll definitely recommend you guys to my friends. " Just wanted to let you know the guys, John and Cody, did an awesome job on the shed. They were extremely hard working & very polite. Not enough people respond to the good things people do only the negative so I wanted to make sure you knew how good your crew was. Please pass along my great appreciation for the job they did. I will definitely recommend you to anyone I know needing a shed." Just wanted to say thanks again for sending John and his crew to build my shed, it looks great and I'm sure I'll get a lot of use out of it. I hope the crew made it home okay as well. Thanks again. " Brian and Sam showed up at seven this morning and left at 1 pm. In between they built a 12×20 Gabled storage building. Both fellows seemed to be running in overdrive all the time. My wife commented that they made her tired just watching. Oh and by the Way, they did a heck of a job and left us with a quality building. One of the things is they had double two by fours at each of the wall joints. They did the job right with a quality product. Thank you so much for your help." Wanted to share some pics of our new shed. You have some very professional and dedicated guys doing the install for you. It took them about a day & half for this one, and it was so cold & windy they had to about freeze, but they'd get in the truck and run the heater every once in a while to warm up. As evidenced from the pics the shed looks great, and after we install steps, paint & landscape it'll really look very nice. We are extremely pleased with the quality and workmanship!! It's been a great pleasure working with you and you crew,"
I looked at sheds for over 3 years and even thought about building it myself. When you compare apples to apples (portable sheds), you are not going to beat this company. Really, go compare! Marty was great to work with and with giving advice. What was promised; was delivered. Professional, prompt, and courteous: is an understatement. 12 x 16 barn built, 5 Hours, Wow! Neighbor who spent two weeks building same size, blown away. I been in another trade industry for 30 years, and it is good to see a company like this exist. Thanks to John and the men working with him. Great Job!" Thanks for your help. Your work crew led by Bryan was excellent, informative, and courteous. I am Very pleased." Attached is a pic of our 12×20 shed built in early February and now painted. Enjoying the shed, thanks again for your great work." Just wanted to drop a note and say thanks for the recent build. We haven't used the shed yet but at first glance, we are pleased with the result. Thanks to you and your team (Bryan, Sam, and Conrad) for your efforts. I love the shed! My neighbor next door said that they may need extra storage soon and you can bet your crew (Bryan, Sam, and Conrad) will be highly recommended. Thanks for the shed installation on Friday. It looks good and over half full already. Wanted you to know that I’m very pleased with my shed, and your crew (Bryan, Sam, and Conrad) were very polite. Thanks for the job well done"
Your guys are just leaving. Very nice job. Thanks for all your help. Crew (John, Mike, and Steve) was wonderful. Your crew (Bryan, Sam, and Carl) installed our shed yesterday. I wanted to let you and Marty know that they were friendly, punctual, efficient and professional! It was a pleasure doing business with your company. Brian and Sam were on time as they said,. Both of them were very professional and respectful. Before I know the shed was done, and not a piece of wood , paper or mess left. I haven't seen such an efficient team work before. 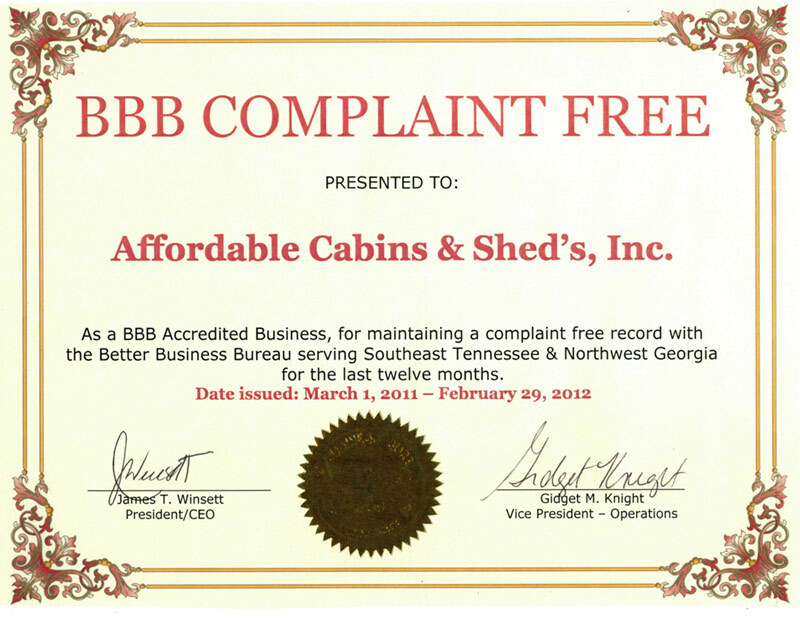 We are very happy with our shed and will continue to refer Affordable Cabins and Sheds to my neighbors, friends and families. God bless you and your hard working crew." I would like to express my appreciation to your company and to the builder, Andy and his crew, for your excellent service and craftsmanship. Brian and his crew (Sam, and Cody) just left my cabin in Blue Ridge, GA. I am stunned. In an eight hour time period they got here, unloaded, and had our 12 x 20 barn roof shed with metal roof completed. It looks GREAT !!! The guys were very polite and cleaned up everything. I am sure my neighbors will be wanting to know where our great looking shed came from, and I will not hesitate to let them know about your wonderful company and your great crew. Thank you so much. My husband finally has his wood working shed. Thanks again." Brian and his crew did an excellent job. They arrived around 6:30am and by the time I arrived home my large storage building was complete. Excellent timing and craftsmanship. I definitely recommend Brian and his crew to anybody that needs a quality installed shed or storage building on their property. Thank You. " John and his crew just left my build. I don’t know how you can build these things for not much more money than what I built my own 10x20 shed for at the house we just moved from. They knocked this thing out. John, the lead guy never stopped moving. I just spent some time jumping up and down in the building and it is solid. Thanks again." 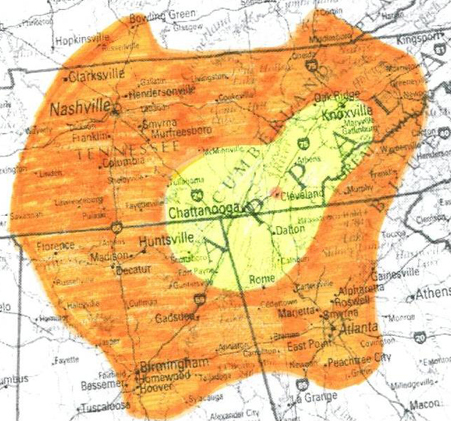 Please call: 423.299.9228 to speak with our professionals today. 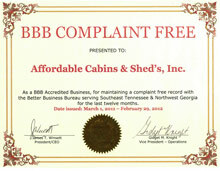 Affordable Cabins and Sheds serves Tennessee, Georgia, Alabama, North Carolina and Kentucky. We service in and around Atlanta, Chattanooga, Cleveland, Clarksville, Henderson, Louisville, Oak Ridge, Marietta, Knoxville, Nashville, Bowling Green, Louisville, Atlanta, Huntsville, Birmingham, Sevierville, Pigeon Forge, Shelbyville, Tullahoma, Lynchburg, Winchester, Belvidere, Flintville, McMinnville, Altamont, Jasper, South Pittsburg, and Gadsden areas.